Most educators of today are engaged in the task of workforce development. One tool within their toolbox is to encourage the use of in-service hours as an opportunity to broaden their knowledge either through conferences or business tours. 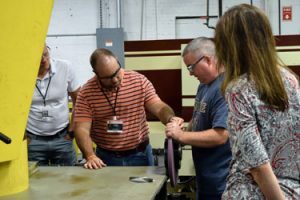 Mike Mitchell (Assistant Principal-Washington County Career and Technical Education Center) recently requested through the Southwest Virginia Alliance for Manufacturing (SVAM) to tour manufacturers within the organization’s seventeen jurisdiction footprint. As part of a national movement, educators and students are concerning themselves with how to better address the ever-changing needs of the workplace as well as the talent shortages within the employment landscape. As the world’s leading pultruder of fiber reinforced shapes, Strongwell was excited to be able to meet and greet regional educators from Holston High School, Abingdon High School, EB Stanley, and Washington County CTE Center. Upon arrival, they were introduced to composite materials and their uses, pultrusion machinery, pultrusion processes, branding, and Strongwell’s corporate history by Te-kai Shu (Social Media and Business Development Manager). About a dozen educators were then divided into groups based upon their field of expertise. Lydia Sinemus (Manager of VA Operations HR and Environmental, Health and Safety) led the trade and technical educators to interview departmental leaders in industrial machining and design, while Meghan Carty (Corporate Purchasing and Pricing Manager) and Te-kai Shu led educators whose primary focus is those who are college bound as they interviewed personnel and interns within information technology, marketing, accounting, purchasing and customer service. 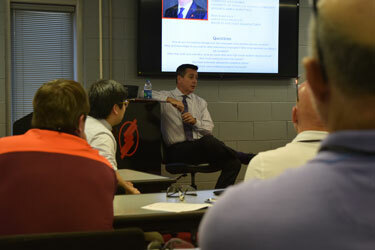 At the conclusion of their tour, educators had a Q&A roundtable discussion with David Oakley (President and CEO) to better understand the future of manufacturing and the education sector’s role in redefining the expectations of the workforce. Educators presented questions regarding potential employment shortages, internal training opportunities, community outreach, and the promotion process of employees.